1. Whisk together first 5 ingredients (through black pepper) in a large serving bowl. Add berries and red onion; let stand 15 minutes. 2. Meanwhile, lightly coat a seasoned cast-iron skillet or nonstick pan with cooking spray, and heat over moderately high heat. Add prosciutto in one layer, and cook, turning, about 5 minutes or until golden brown and crispy. Transfer to a plate to cool; crumble and reserve. 3. 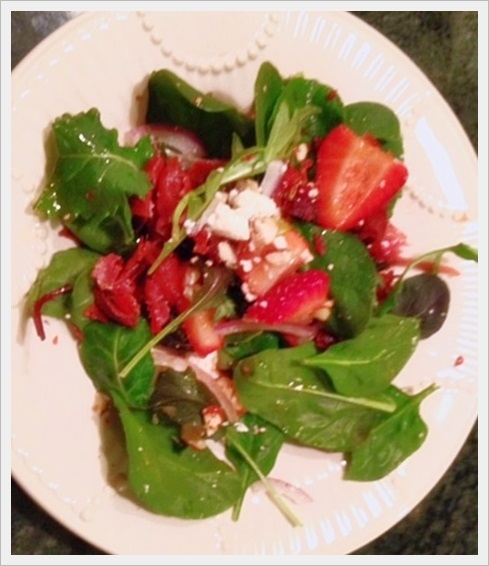 Place the baby arugula in a large serving bowl with the cheese; add the strawberries, red onion, and balsamic dressing, and toss gently until just coated. Divide the salad among 4 serving plates, and top evenly with the cooked prosciutto.